There's a nice review round-up of recently released Sparkplug Comic Book titles including Eschew #2, Neptune, Department of Art #1 and Whirlwind Wonderland on the Bookgasm website. Book critic, Rod Lott calls my style a "cut-above Roz Chast!" Talk about a compliment, totally undeserving, but I will definitely put that in my pocket! Bobot in the role of John 'Kit' McKittrick in "The Fallen Sparrow". I'm excited and scared to be the Cartoonist-In-Residence this Saturday at the Charles M. Schulz Museum in beautiful Santa Rosa, CA! I will be drawing, talking, nervously laughing, awkwardly posing for you and a bunch of kids young and old from 1-3pm. I hope they are nicer to me than my favorite Peanuts bit players Thibault would be. Anyway, stop on by. I love this museum, so if you can't make it, you should go sometime soon! Meet watch and talk to Rina Ayuyang, cartoonist and creator of 'Namby Pamby,' a mini-comic series that explores the humorous side of life's ordinary moments. Ayuyang's latest book, Whirlwind Wonderland, was recently published. There's a nice review of Whirlwind Wonderland in the new issue of Giant Robot magazine (Issue 66) with the mesmerizing Scott Pilgrim cover. 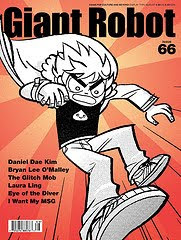 This is one of my favorite magazines so I'm pretty excited, and this issue is pretty amazing with interviews with Bryan Lee O'Malley, Daniel Dae Kim, and Laura Ling. So make sure to check that and future issues out! It's always a fun, educational read!